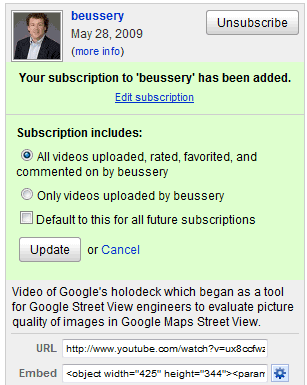 When you subscribe to a YouTube channel, you're no longer notified only when someone uploads new videos. Now YouTube subscribes you to "all videos uploaded, rated, favorited, and commented on" by a certain YouTube user. You can change the default option by clicking on "edit subscription", selecting "Only videos uploaded by ..." and "Default to this for all future subscriptions", but not many people will find those options. This feature has been added last month, but I only found about it today. YouTube's help center has more information: "A YouTube subscription means subscribing to a user's videos and their public activity (their favorites, their ratings, etc). By subscribing to a user, you'll receive updates and stay informed when something new occurs." YouTube's options page lets you disable your activity feed. "If you'd like to change which of your actions are publicly available on your channel and Recent Activity Feed you'll need to make updates on the Sharing Settings page. There, you'll see many actions, and boxes next to these actions. When you select a box, it will appear on your channel, and users subscribed to you will be notified when you perform this action. For example, if you have "Favorite a video" selected, other users will see a subscription update when you add a new video to your Favorites." It seems that YouTube is promoting its social component more aggressively by suggesting potential friends from the list of Google contacts, by enabling activity feeds and engaging interactivity. I've been using this for a while now and like it. I can see what my YouTube friends are watching, rating, and commenting on.